Garden Valley Trail Rides offer a variety rides on friendly horses through the beautiful Garden Valley area. Bring a group of friends and make it a fun afternoon! In Winter, take a breathtaking sleigh ride and view and feed the local elk, see the eagles soar and enjoy the other sights and sounds of this winter wonderland. Cascade Raft and Kayak has been offering Idaho whitewater rafting trips since 1985, bringing families together one splash at a time. With a variety of whitewater rafting trips from a mellow half day river float to a full day of whitewater thrills, Cascade Raft and Kayak offers the best Idaho rafting experience on the Payette River. Located just 45 minutes from Boise, Idaho overlooking the Main Payette we also offer group river rafting adventures and catering. So make a splash for this year`s office party or teambuilding event with an Idaho whitewater rafting trip and Cascade Raft and Kayak. www.cascaderaft.com or call 208-793-2221. ELK SPRINGS RANCH is located in the beautiful mountains along the Middlefork of the Payette River in Garden Valley, Idaho at an elevation of 3200 ft. A one hour drive North of Boise, Idaho. The conditions for raising Elk here in the Valley are ideal and a very natural habitat for these magnificent animals. We have beautiful green rolling hills and clear spring water. Your tour will include a ride on the trailer to feed the majestic Elk. You will also learn about the many uses of Elk products and why Elk have been domesticated. The Tour starts in the afternoon by appointment and the cost is $10 per person. Be sure to bring your camera to take pictures! Learn about Velvet Antler. Velvet Antler promotes energy and vitality. Strengthens body systems and increases stamina and enhances performance. Learn about Elk Meat. Gourmet Premium Elk is a delicious highly nutritional meat product. No antibiotics, no preservatives, no artificial ingredients and no hormones. Naturally raised on grass, hay and grain. The true Idaho river experience! Located in beautiful Banks, Idaho at the confluence of the North Fork and the South Fork of the Payette River, Bear Valley Rafting Company is the ideal place to fulfill your true Idaho river experience! � day, full day and BBQ trips for the beginner to the adrenaline junkie! Our trips are led by the most experienced guides on the Payette River; they incorporate their passion for the river into every trip! Visit our website for details and to book your adventure! www.bearvalleyrafting.com or call 208-793-2272. ZIP IDAHO, the home of Idaho�s premier zip line tour company, along with our partner Experience Based Learning (EBL), have built a tour with 7 zip lines. We are based in Horseshoe Bend, Idaho and provide a unique eco-adventure that combines tree based canopy-tour style zip lines with Idaho�s longest zip lines. Zip lining is a great half-day activity for corporate groups, parties, reunions and dates. 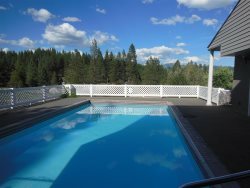 Visit our website to get more details about this exhilarating experience, www.zipidaho.com or call 208-793-2947. Idaho�s Premier Family theatre, Starlight Mountain Theatre is an out door summer playhouse located in the beautiful mountains of Garden Valley. The theatre seats 300 patrons in stadium-style seating. The theatre�s designed elevation creates a perfect view from every seat. Visit our website, www.starlightmt.org or call 208-462-5523.